Solstice, Ray Rose’s latest practice shoe is available in 2 great, super soft finishes. Dancers can choose from super soft black perforated leather or Italian super soft leopard print leather, which is listed separately. A lightweight practice shoe featuring a split sole, making it flexible too. 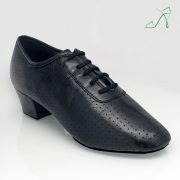 Suitable for Ballroom and Latin Dance practice. Additionally, Solstice is ideal for other forms of dancing including jive, line dancing, Ceroc, Lindy-hop, Rock and Roll etc. The Solstice is a comfortable and flexible practice shoe allowing prolonged wear for a variety of dance practice. This is due to the lightweight design, round toe and split sole. It has a 1.5″ Practice heel. Moreover, the heel is made with Sports grade support material providing support and balance. Solstice has an antibacterial lining. 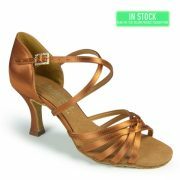 Furthermore it features bio-mechanically latex arch support and heel cushioning adding comfort for long hours on the dance floor. Antibacterial lining, bio-mechanical latex arch support and heel cushioning.